But researchers at the University of Arizona say they have a better concept that would cost a fraction of those technologies: an inflatable sailplane that weighs just 11 pounds (5 kg) and sports a wingspan of 18.7 feet (570 cm), that’ll cruise high above the Martian landscape and survey from a bird’s eye view. Most of the wing structure will be covered in a UV-sensitive material that hardens when exposed to sunlight. After about an hour of UV-curing, the sailplane will have enough structural integrity to deploy. A cold-gas propulsion system will allow it to take to the skies at an altitude of 5,900 feet. The sailplane could also assist other missions or even find suitable places for future human habitation on the Red Planet. 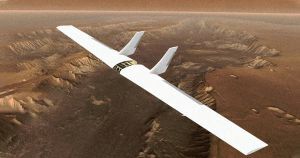 “The Mars sailplane concept proposed here provides a whole new avenue for accelerating exploration of the Martian surface at a fraction of the cost of previous Mars airplane concepts,” reads the paper.